Gov. Jim Justice has requested WVPB be funded at the same level as this year - $4.6 million. Justice's original budget contained no state funding for WVPB, but he revised that request to full funding in a letter to lawmakers in March. On April 13, Justice vetoed the budget passed by the Legislature. 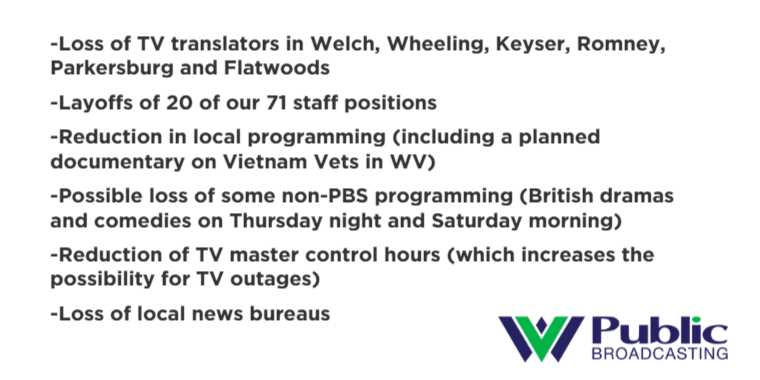 If WVPB's state funding is reduced by $1 million, these are some of our cost-saving options. Now, all three sides (House, Senate and Governor) will continue negotiations to reach an agreed budget. What does this means for WVPB? All funding levels are still on the table, and would be decided before and during a special session. That special session is expected sometime before the constitutional deadline of July 1. The Friends of West Virginia Public Broadcasting plans to continue its "Back in the Budget" campaign until a budget bill is signed. Also, you'll continue to see and hear "Protect WVPB" stories on the radio, TV and social media. Check out our playlist. An unprecedented number of WVPB supporters have called and emailed lawmakers, according to House Finance Chairman Eric Nelson in a speech to fellow House members. "I’m not sure if I’ve received more emails and calls than on this one particular line item. Unbelievable," Nelson said. Nelson defended WVPB in response to an amendment from Del. Marty Gearheart, R-Mercer, that would zero out funding for WVPB. “They provide a very valuable resource,” Nelson said. “This is where Mountain Stage is, too. You talk about something that is out there promoting the state of West Virginia; this resource right here. 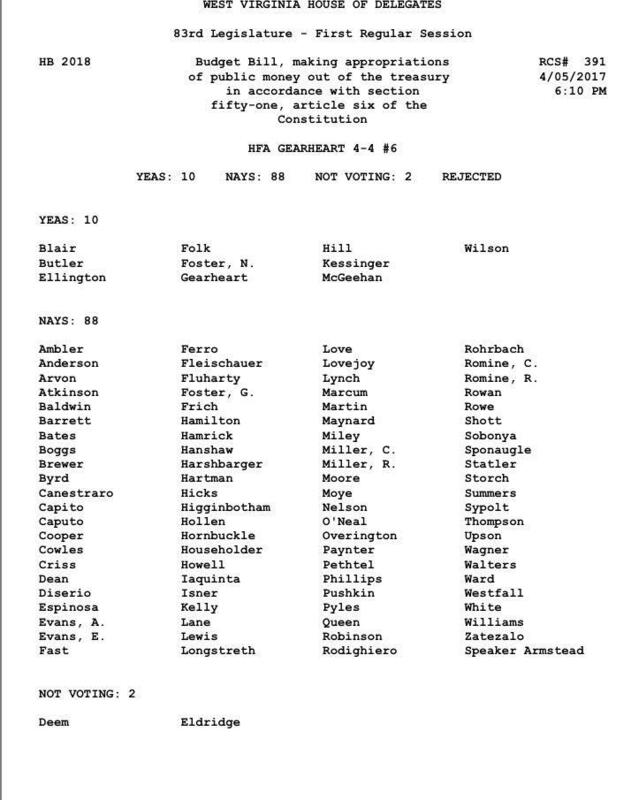 Roll call vote on House Amendment to eliminate state funding for WVPB. It was defeated, 88-10. “This is a very solid entity. I urge rejection of the gentleman’s amendment, so we can continue this service," Nelson said. A total of 88 delegates voted to keep WVPB back in the budget – 10 members voted to eliminate funding. The House bill that would have eliminated the Office of the Secretary of Education and the Arts (OSEA) failed to pass the Senate. WVPB is governed by the Educational Broadcasting Authority, which according to state code "is part of the Department of Education and the Arts for purposes of administrative support and liaison with the office of the Governor." 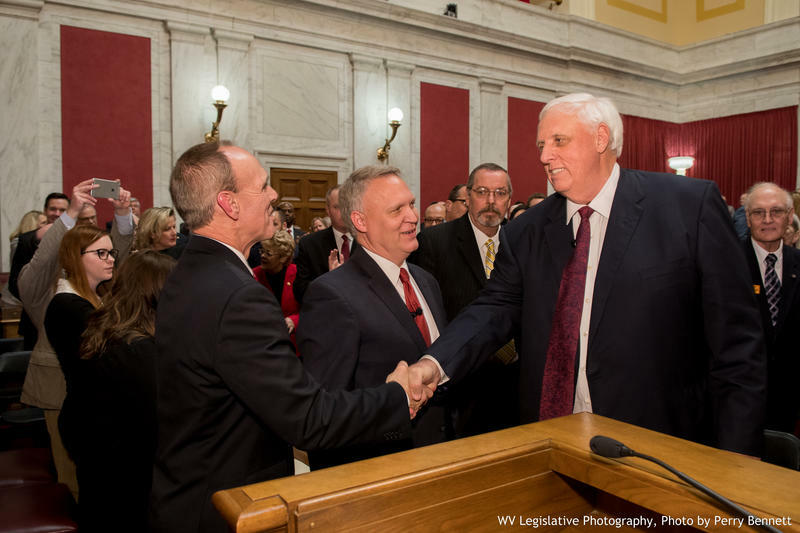 Finally, Governor Justice has expressed interest in transferring WVPB from a state licensee to one governed by a land-grant university such as WVU. No bill has passed the Legislature to transfer the licenses from the state to WVU or any other entity. The Educational Broadcasting Authority has recommended this issue be studied in depth, with recommendations and options returned to the Legislature, Governor and other interested parties. 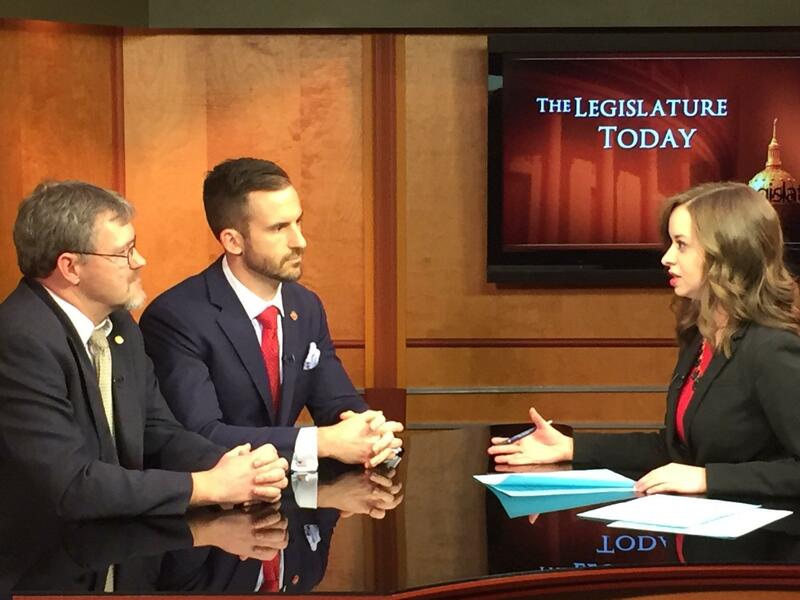 Day 61: The Legislature Passes a Budget, But Will Justice Sign It? Nearly an hour after midnight on Sunday morning, the West Virginia Legislature completed action on a budget bill for the 2018 fiscal year. The budget bill was passed, as amended in the Senate just before midnight, on a 22 to 12 party line vote. The House of Delegates concurred with those amendments on a 63-37 around 1:00 a.m. The bill now heads to Gov. Jim Justice.